Since 2013, we have hosted more than 1000+ professionals in our properties across Singapore! One Common Bedroom in Castle Green Condo is available for rent. This is a 4 bedroom condo with 4 bathrooms; size around 1300 Sq.ft occupied by working professionals. Can use all house facilities including living room & kitchen without restrictions. 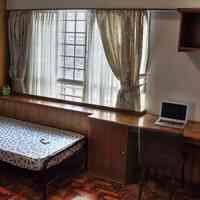 Close to MRT, Food Centres and Market, Bus Stop at Doorstep. Weekly Housekeeping Service for Common Areas. Large TV in the living room; Sofa, Dining Table / Computer Table, Cooker hood / hob, Gas, microwave, Fridge, Washing machine, High speed Internet connection (Wifi connection). Besides rent you will also incur additional facilities fees.